LES PORTES DU PLENEY Exclusive development of 12 apartments. PRIME location in the centre of town. 1 minute from the Pleney Telecabine. 4 minute walk to the Super Morzine Telecabine. It will be built to the highest specification. Each apartment is spacious with open plan living areas. Completion, June 2018. Secure garages for all apartments…. A stunning development of 7 luxury apartments in a residence of 2 buildings, just 150 metres from the pistes and 300 metres from the village. 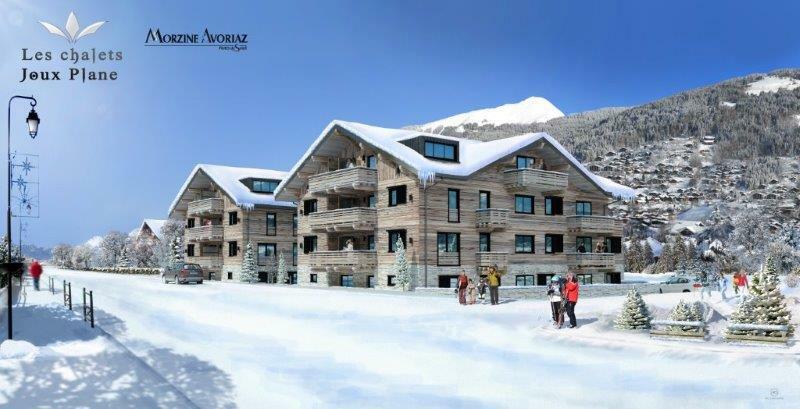 High specification new build development, ski in ski out apartment at the bottom of Pleney slopes in MORZINE. New 6 year high reached in early trading today GBP/EUR has traded to the highest level seen since October 2008 (1.2931 interbank) in this morning’s session. Morzine centreLocated in the centre of Morzine on the Pleney slope this is an exceptional opportunity to purchase the rare “ski in ski out” apartment from just 50m. Ideal situation given there is absolutely no need for a car once at your apartment. Skiing, bars, restaurants and shops are all at your doorstep.